What do Kim Kardashian, LeAnn Rimes, and Cyndi Lauper all have in common? Psoriasis. What is psoriasis? This is Psoriasis explained - causes and symptoms. Psoriasis Explained - What is Psoriasis? Psoriasis is a chronic and, unfortunately, incurable disease that causes thick, red, itchy, plaque-like lesions on the skin. These lesions are typically covered with silvery scales. They occur most commonly on the elbows, knees, and the scalp, but psoriasis can occur anywhere on the skin. Psoriasis is not contagious, and you cannot catch it from someone else. I had a patient who once tried to argue with me about this. 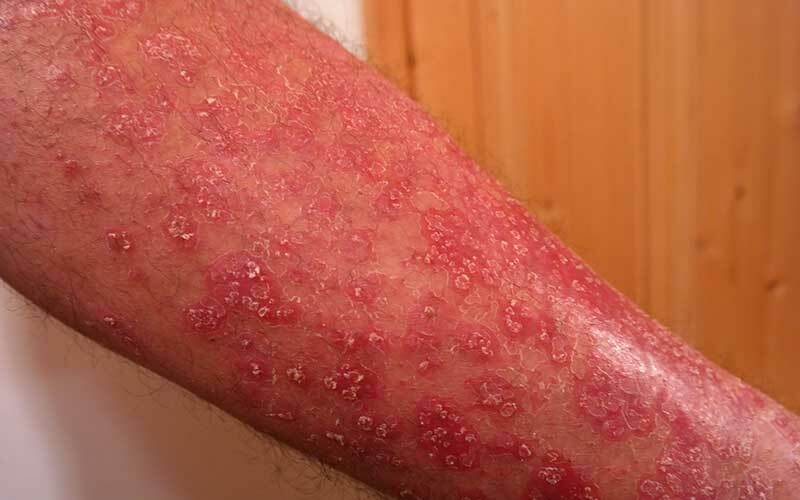 I told her that psoriasis was not contagious, and she said, "Uh-uh, Dr. Frita, I think it is contagious, because I went to a friend's house, and there were like three other people there who also had those 'scaly' things on their skin." I asked her, "Were these other people with the skin lesions related to each other?" She was like, "Yeah. It was their house." Then I explained to her that, in 40% of patients with psoriasis, there is a first-degree or a very close relative who also has psoriasis. Psoriasis is genetic. It is not contagious. Kim Kardashian has been very open about her diagnosis with psoriasis. She has even allowed the cameras to follow her on Keeping Up With The Kardashians into her doctor's office as she discusses and learns about psoriasis. Her mother, Kris Jenner, also has the diagnosis of psoriasis, which supports the fact that it is genetic. I know what some of you are thinking. You're like, "Okay, Kim Kardashian has a little skin problem. So what?" Others may probably think she sits around like, "Khloe, I like literally have psoriasis, but I am still like so pretty." Psoriasis is more than just skin deep. It is a systemic illness, and I guarantee that if Kim Kardashian were not so open and honest about her diagnosis, there's no way that psoriasis and its treatments would be getting all of the attention that they are getting today, so I applaud Kim K.
Over 7.5 million Americans are affected by psoriasis. Psoriasis can be associated with certain comorbidities like heart disease, cancer, diabetes, hypertension, and in some severe forms of psoriasis there can be an association with kidney, liver, and respiratory illnesses. 10 to 25% of patients with psoriasis also have psoriatic arthritis. So no, psoriasis is not just superficial. It is definitely more than skin deep. Well, we don't know exactly what causes psoriasis, but we do know that it's caused by a combination of genetic, immune, and environmental determinants. If you have psoriasis, yes, you have a genetic predisposition, but something environmental must trigger the psoriasis, like stress for example. Once that psoriasis is triggered, your immune system is turned on, the T cells specifically. Now, the T cells typically fight viruses and infections, but if you have psoriasis, your T cells turn on your own skin. These T cells migrate to the skin and cause an inflammatory reaction, so then you get enlargement of the blood vessels that cause skin redness. The T cells also stimulate a proliferation or growth of your skin cells. This causes thick skin or plaques. Your immune system also causes an irritation of your nerves. This can cause itching or pain. There are several types of psoriasis, but plaque psoriasis is, by far, the most common. This is the one that Kim Kardashian has. In plaque psoriasis, that's when you get those silvery scales on the thick, red, plaque-like lesions mostly on the elbows, the knees, and the scalp. Plaque psoriasis accounts for 80% of psoriasis. There are other forms, though, including pustular psoriasis, nail psoriasis, inverted psoriasis, and there are a couple others as well. There are certain risk factors for psoriasis or things that can exacerbate psoriasis or make the symptoms worse. These include smoking, excess alcohol consumption, obesity, certain drugs like beta blockers, lithium, and vitamin D deficiency is a risk factor for psoriasis. Although there is no cure for psoriasis at this time, there are several treatment options. Some of the treatment options include topical medications, so you have emollients or just moisturizers for the skin. You also have topical steroids or other topical immunosuppressants. Tar can be placed on the skin as a treatment, and then there are also topical vitamin derivatives. Ultraviolet light can help with psoriasis. However, patients must be counseled because long-term use of ultraviolet light does put you at risk for skin cancer. There are oral medications to treat psoriasis, such as retinoids and methotrexate, and then there are the newer injectable medications or biologics. You've probably seen the commercials. Cyndi Lauper, who has psoriasis, has been on a Cosentyx commercial, and that's what she says that she uses to treat her psoriasis. Cyndi Lauper was also a guest on the Wendy Williams show, and she actually said, at that time, she had practically no lesions and that her treatment was working for her. Other injectables include Humira, Enbrel, Stelara, and Remicade. If you have psoriasis or think you have psoriasis, go to your doctor and confirm the diagnosis and then talk to your doctor about which treatment option is best for you. If you see someone with psoriasis, please don't stare and be obnoxious, and please don't toot up your nose and act like psoriasis is something you can catch. Psoriasis is not contagious. Be kind and be sensitive. Do you know someone with psoriasis? Are you struggling with psoriasis? Leave me a comment down below, I'd love to hear your thoughts.